Western San Miguel and Montrose Counties, which edge up against the Utah border in a vast patchwork of redrock canyons, juniper forests and sage-covered mesas, are better known for their extractive pasts than their fruit production. But look closer into the history of the area, and you’ll find a surprisingly robust industry of stone fruit horticulture. Near the turn of the 20th century, farmers and homesteaders in the area put in nurseries, planted orchards and experimented with hardy heirloom varieties that thrived across the arid environment. The result? Growers produced fruit of unsurpassed quality, including giant apples, sweet peaches and exceptional pears. 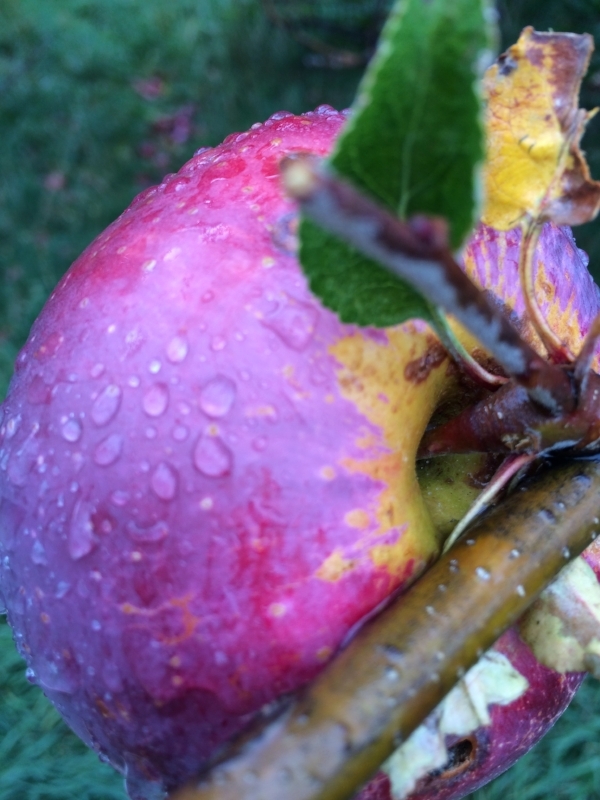 A survey conducted in 1922 tallied more than 60,000 apple trees in Montrose County alone. As the decades passed and economies evolved, many of these trees have been lost to time and history. But hundreds remain, growing in forgotten fields, neighborhood backyards or orchards that have all been abandoned. And one local organization has set out to revive both the trees and the area’s culture of heirloom fruit production. That’s Apple Core Project co-founder Melanie Eggers. She’s walking through a lush 100-year-old orchard near Nucla that’s inhabited by some of the tallest apple trees I’ve ever seen. Thanks to a warm spring, these trees are so loaded with apples that many of the branches are buckling under the weight. A peach tree, plus a handful of pears and plums, also grow on the property. Sprouting in the grassy openings beneath the giant fruit trees, meanwhile, are dozens of tiny newly planted saplings. These trees, which the Apple Core Project has grafted from a spectrum of varieties, represent the potential of what heirloom production can be out here. Welcome to the future home of the Apple Core Project’s preservation orchard. Here, the organization hopes to educate the community, experiment with varieties, grow trees and nurture the region’s fruit economy. It’s part of a host of initiatives the project has undertaken since it launched in the summer of 2015. It has also mapped and collected data on more than 500 trees in the region, distributed apples to the Fresh Food Hub in Norwood for sale and organized community events for tasting and celebrating local fruit. Even more notably, the project has grafted some 250 trees onto root stock, selling the baby trees to West End locals, and planting them in schools and community gardens, as a way to ensure that a new generation of heirloom fruit trees live on. The hope is to raise awareness and hopefully, kick-start a dormant industry. Along the way, they’ve discovered a wild spectrum of varieties. These include heirloom apple varieties like Yellow Bellflower, Grimes Golden, Summer Banana, Paragon and York Imperial, as well as Duchess pears and Old Mixon peaches. Eggers says some of her favorites include the Wolf River, a giant red variety known as a one-pie apple, and the Chenago Strawberry, a tiny early harvest apple that smells like its namesake berries. The Apple Core Project was launched after Eggers, her husband Bodie Johansson and fellow co-founder Jen Nelson all took a tree grafting class through the Montezuma Orchard Restoration Project near Cortez. The class ignited a spark of inspiration and got the ball rolling. And it’s not just about kick-starting an antiquated way of life. Eggers says the project can also be part of a broader effort to revive the economy of the region, which has been in a long slump with the shut-down of uranium mining and more recently, the news that a power plant and associated coal mine in Naturita will shutter by the end of 2022. Between restoring forgotten orchards and getting new ones established, the project approaches its goals from both the past and the future. And with a banner fruit season in store, it’s shaping up to be a prime year for showcasing the potential of fruit production in this sleepy corner of rural Colorado. For Western Slope Resources Reporting, I’m Katie Klingsporn.